World 400-metre track champion Wayde van Niekerk may have missed out at the annual IAAF Awards ceremony in Monaco on Friday but every cloud has a single lining! South Africa’s Olympic champion and 400m world record-holder Van Niekerk lost out to Qatar high jumper Mutz Essa Barshim for the Male Athlete of the Year Award but there was joy for his coach, Tannie Ans Botha who was given the Coaching Achievement award. The 76-year-old mentor capped her lengthy career by making a crucial contribution to Van Niekerk’s progress in recent seasons, after guiding numerous other elite South African athletes over the last 50 years. 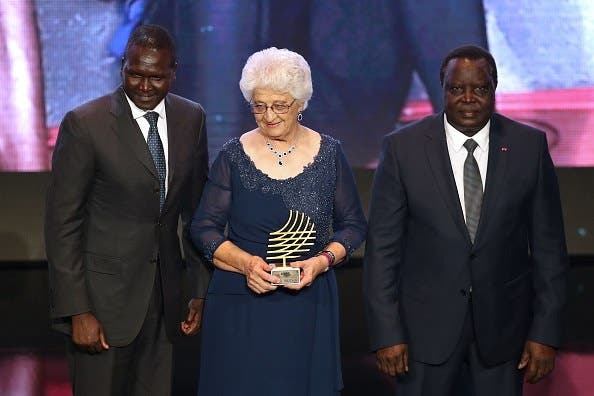 Coach Botha has been leaving her mark on African athletics since the late 1960’s and has been head athletics coach at Free State University for 27 years. Van Niekerk was one of three South African athletes in the 20 nominees, the others being world long jump champ Luvo Manyonga and Caster Semenya who failed to make the shortlist. Van Niekerk was up for global honours alongside Barshim and British distance legend Mo Farah. Female Athlete of the Year was Belgian heptathlete Nafissatou Thiam. Van Niekerk is currently rehabilitating after knee surgery to correct ligament damage suffered in a charity touch rugby match in October. ‘We congratulate everyone who was nominated for the award,’ said Aleck Skhosana, president of Athletics South Africa. ‘That alone, is a tremendous world achievement. ‘It’s a great honour to be in the top three selections, even if you don’t bring the trophy home. A special tribute to Tannie Botha who flew the national flag high following her crowning as the best coach in the world.